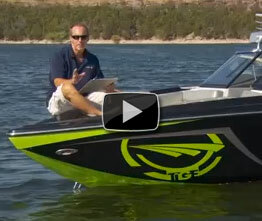 Our reviewer says this 20 foot towsports boat can still go BIG, in spite of its small size. Wakeboarding's all about BIG. Big air, big sound, big room to bring all your friends along for the ride. 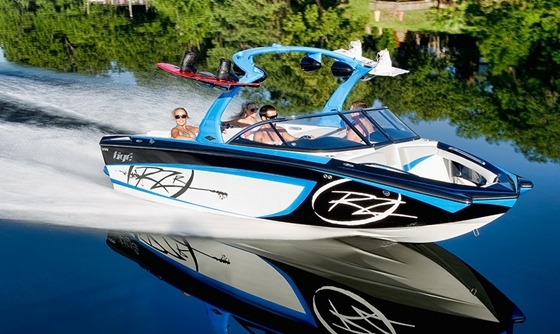 Not everyone's a match, however, for a 24 foot wake machine. That's why Tigé created the RZR. It's got all the features of the company's flagship line, in a more compact 2o foot package that Tigé promises to be an exceptional value. Is it? Let's find out. Daniel Gutierrez, Tigé Boats: I think it's because we felt that we could put the bigger is better mentality and the feel into a smaller boat. So the RZR is a very large and spacious design, for being a 2o foot boat. 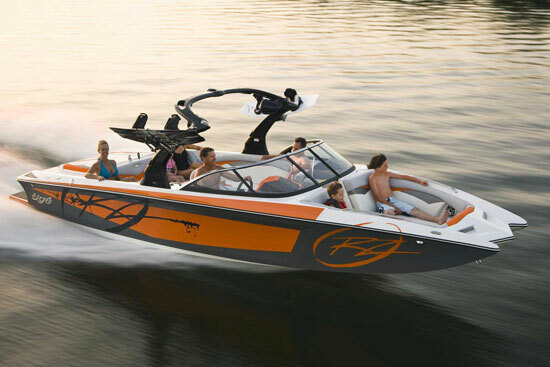 But it also allows people with a restricted waterway and they need a limited size boat or someone who has to tow several hours or a long distance in order to use the water, it gives them a boat option that isn't compromising in that big boat feel. Daniel: Absolutely. It's a boat that's not only designed to feel big but it has the performance of a big boat as well. So you fill up the different ballast options that we have, you can make a killer wakeboarding wake, or a surf wave that's absolutely huge, in really a matter of minutes. The Tigé hull is unique in the towsports industry in that it has rocker, or an upward curvature from end to end. 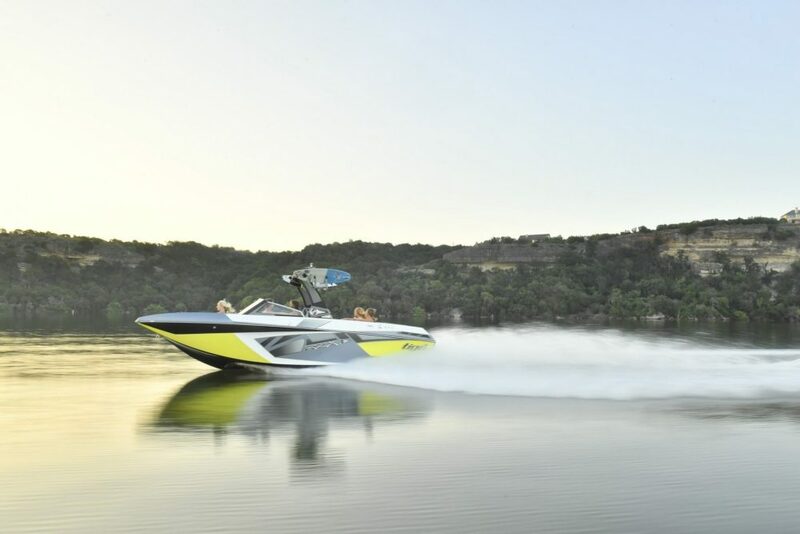 Add a trimtab like plate at the stern, and the driver can alter wake shape on the fly, shrinking or pumping up the wake's shape and size. Tradeoff: I thought the RZR tended to porpoise in certain conditions, although I found the problem could be addressed by utilizing that TAPS system to do something few inboards can claim: trim to match the conditions. My test boat reached 40.9 mph, with a 343 hp, 5.7L PCM V drive. The best cruise was on at 28 mph, where the boat achieved 3.22 mpg. Let's take a closer look at some of the features. One of which is Tigé touch. It's an iPad like display that lets the driver have control of all of the major functions. From here, I can easily put water into the ballast tanks, set the speed control, monitor the engine functions, and of course, pump up the volume on my stereo. Like most watersports towers, this is too tall to fit in a standard garage. But it's easy to lower. Just pull two pins, then though the job would be easier with two, one person can actually walk it back toward the transom. Tigé places a lot of emphasis on style. This alpha Z tower is a good example. It's also though extremely functional. Its cast aluminum construction is really solid, it has mounts for the speakers, boardracks. The boardracks have a nice feature; push this button and the boards swivel into the cockpit, making it easy to get geared up. Aft, I like that these storage compartments open toward the outside. 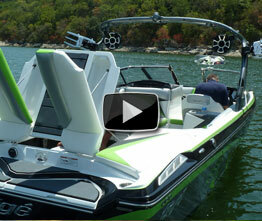 It makes it easier to load up at the dock or on the launch ramp. I also like this recessed platform; it makes a nice spot to get geared up to go wakeboarding or waterskiing. So did the RZR hit the mark? I'd argue yes. 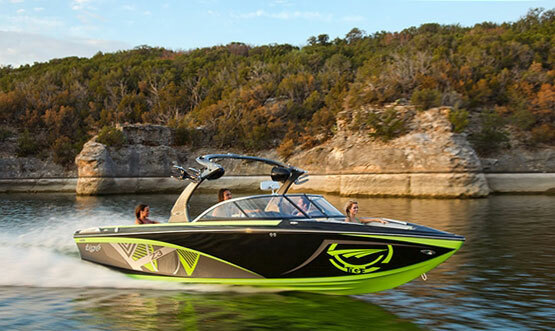 Room, features, and style are all on par with the company's larger models, while the TAPS system and the convex V hull gives the boat the dual personality it needs to score with its target audience. In short, this is one little boat that can still go big.